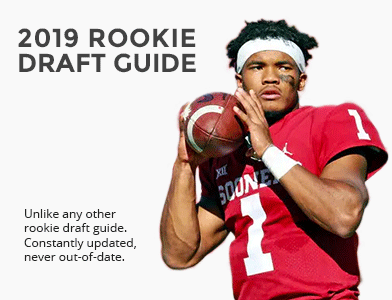 The NFL Draft and a large number of dynasty rookie drafts have wrapped up and we are nearing the long stretch of the off-season until training camps begin in late summer. This will be the time when many in your leagues “take a break,” which is just another advantage for you dynasty players. Here’s the top news from the past several days in the NFL. The deadline for the Chicago Bears and star receiver Alshon Jeffery to agree to a contract extension has pass, ensuring Jeffery will play the 2016 season under the terms of the franchise tag. This also means Jeffery will again be an unrestricted free agent following the 2016 season. There are some whispers out there stating that the Bears may not even view Jeffery as an elite WR1 level asset. This seems to suggest if Kevin White meets expectations, Jeffery could be looking for a new team a year from now. For now though, Jeffery is still a valuable dynasty asset and one whose price is very reasonable, given his expected production. Another player and team missing the Friday deadline to sign a long-term deal was last year’s breakout quarterback, Kirk Cousins. Cousins displaced former first-round draft pick Robert Griffin III and had a huge season, but it wasn’t enough to earn an extension from the Redskins, who will wait another season before considering keeping Cousins for the long haul. Cousins is still relatively undervalued in dynasty leagues and makes a decent target for quarterback needy teams. Bills second-year running back Karlos Williams was suspended for four games after violating the league’s substance abuse policy. It’s unclear of Williams’ exact violation, but it adds to an already poor off-season for Williams, who showed up to OTAs overweight. Once viewed as a player who could challenge LeSean McCoy for the starting job, Williams is now firmly in the dog house. In dynasty leagues, he makes a decent buy low target, assuming his value is on the decline. Over the past several days, we’ve learned the four game suspension handed down to Patriots quarterback Tom Brady had been upheld and then, most recently, Brady announced he would not appeal the suspension any further. This means, barring the NFL Players Association taking the case to the Supreme Court on Brady’s behalf, the future Hall of Famer will indeed sit out the season’s first four games. This actually means very little for Brady’s dynasty value considering his age and already knocked that down far enough, but it will presumably give unproven backup Jimmy Garoppolo a chance to start the first four games. The Patriots have a history of stashing players only to trade them at what seems to be the perfect time. Now, we will all get a chance to see if Garoppolo has a future for the Patriots or perhaps elsewhere in the league. While you likely won’t be using him in your lineup early in the season, Garoppolo is worth stashing in deeper dynasty leagues. After being investigated for an accusation relating to a sexual assault, it was announced that Philadelphia Eagles receiver Nelson Agholor would not be charged in the case. This is obviously good news for Agholor and the Eagles, who hope for improved play from their sophomore receiver, who struggled in year one under Chip Kelly. While Agholor is expected to battle Rueben Randle for a starting role, both receivers, along with Jordan Matthews, should see plenty of time on the field together. Bills rookie running back Jonathan Williams was arrested and charged with driving under the influence. Drafted in the fifth round Williams had a shot at legitimate playing time given the off-season issues of Karlos Williams, but this puts a damper on that possibility. The troubles of both Williams likely means Mike Gillislee starts the season as the prime backup to McCoy. He is worthy of a roster spot in deep dynasty leagues. A local beat writer believes Packers receiver Davante Adams is in danger of not making the final roster for Green Bay. Adams has struggled in his two-year career, primarily last season when he was given a chance at additional playing time during the injury to Jordy Nelson. The expectations for Adams just a year ago were through the roof, with his dynasty ADP reaching as high as the third round. Adams is looking like a bust, but his price has hit rock bottom. Now might be a good time to take a risk by acquiring Adams for a future third-round pick. Another young receiver who could be in danger of losing his job is Tampa Bay’s Kenny Bell. After missing his entire rookie year, Bell was viewed as the favorite for the third receiver job earlier in the off-season. Now, he’s battling Donteea Dye for a roster spot after being bypassed by Adam Humphries and Russell Shepard. With training camp opening later this month, Bell will have another shot to move up the depth chart, but the fact that he’s already fallen down the ranks is a concern. Much like Adams, if Bell is or was a player you believe in, now is the time to take a shot and buy low. Falcons running back coach Bobby Turner recently discussed his plans for the Atlanta backfield in 2016 and said he expects the touches for Devonta Freeman to decrease while second year back Tevin Coleman should see the field even more. This should not really be a surprise considering Freeman was a workhorse after taking over the job early last season. Coleman was relegated to mop up duty once he returned from a minor injury in mid-season. Coleman’s price is clearly on the rise. I have Karlos Williams on my roster and hope he doesn’t do anything else daft before our league’s roster cuts are imminent or I’ll have consider giving him the heave-ho. As is, there is now the consideration of whether to roster both him and Gillislee. Darn it Karlos, you’ve got so much potential, don’t mess it up ! !